The APT format is very simple and straightforward. The pixel intensity from the instruments AM modulates a 2.4 kHz tone, the sub-carrier, which is then used to FM modulate the 137 MHz carrier. Therefore, the receiver consists of an FM receiver followed by an amplitude detector that translates the amplitude of the 2.4 kHz audio tone to pixel intensity on an 8 bit gray scale. The details including line sync and framing are available in the NOAA KLM user’s guide section 4.2.
where s1 and s2 are two consecutive samples. If it’s not obvious, try to draw a sine wave and do the math using any two samples separated by 90°. You’ll see that the above formula gives the correct amplitude regardless of where you pick the samples. 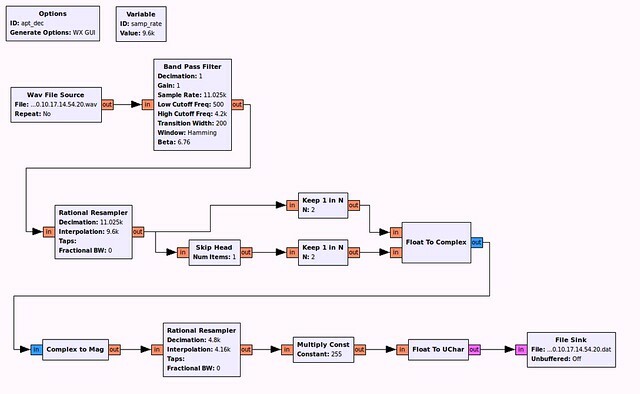 Below you can find an implementation of this algorithm in GNU Radio Companion. The band pass filter is necessary to reduce the noise in the audio, which can be quite significant in particular for audio with higher rate, like 44.1 or 48 kHz. since there is no square root in GNU Radio Companion I pack S1 and S2 into a complex sample and calculate the magnitude. Finally, the output stream is re-sampled to 4160 samples per second which is the symbol rate of the APT data. The data is converted to unsigned char corresponding to the 8 bit resolution of APT. The resulting image is shown below. The black bar at the bottom is because there wasn’t enough data for 1500 lines. As you can see a practical decoder will need some more tuning to produce a perfect image. The dynamic range looks quite good though, as you can see from the telemetry bars. 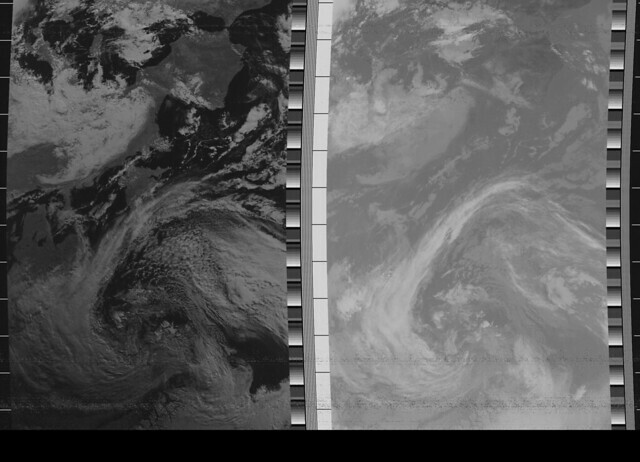 The same data decoded and contrast enhanced using wxtoimg on Linux is available here. The curvature in the image is timing skew caused by Doppler shift. The simple decoder runs at a fixed clock; however, the clock in the signal runs too fast while the satellite is approaching, and too slow while the satellite is receding. Too fast TX clock will lead to lost pixels in the received image (lines are shorter), while the too slow clock will cause too many pixels (lines are longer).